This patient has SVC syndrome most likely secondary to a Pancoast tumor. RT (option A ) alleviates the symptomatology, which would be the next step in mgmnt. c) CT guided percutaneous needle biopsy.treatment would be given after nature of tumor determined. 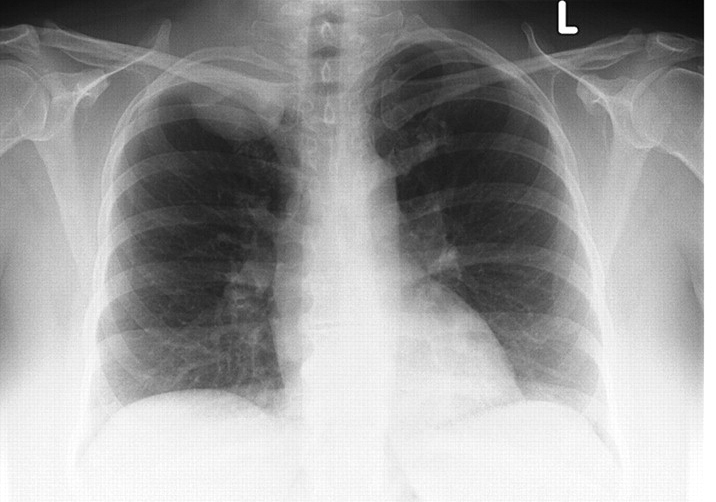 i would agree w/ sara ,this mass in the upper lung zone should be dx first ,then do treament. •A CT scan of the chest is the initial test of choice to determine whether an obstruction is due to external compression or due to thrombosis. Most patients with superior vena cava syndrome (SVCS) present before the primary diagnosis is established. Controversy often arises in the treatment of a patient with superior vena cava syndrome (SVCS) in regard to the need for pathologic confirmation of malignancy before the start of therapy. Patients with clinical superior vena cava syndrome (SVCS) often gain significant symptomatic improvement from conservative treatment measures, including elevation of the head of the bed and supplemental oxygen. Emergency treatment is indicated when brain edema, decreased cardiac output, or upper airway edema is present. Corticosteroids and diuretics are often used to relieve laryngeal or cerebral edema, although documentation of their efficacy is questionable. Radiotherapy has been advocated as a standard treatment for most patients with superior vena cava syndrome (SVCS). It is used as the initial treatment if a histologic diagnosis cannot be established and the clinical status of the patient is deteriorating; however, recent reviews suggest that superior vena cava syndrome (SVCS) obstruction alone rarely represents an absolute emergency that requires treatment without a specific diagnosis. [3, 25] ◦The fractionation schedule of radiation usually includes 2-4 large initial fractions of 300-400 cGy, followed by conventional fractionation of 150-200 cGy daily, to a total dose of 3000-5000 cGy. The radiation dose depends on tumor size and radioresponsiveness. The radiation portal should include a 2-cm margin around the tumor. ◦During irradiation, patients improve clinically before objective signs of tumor shrinkage are evident on chest radiography. Radiation therapy palliates superior vena cava (SVC) obstruction in 70% of patients with lung carcinoma and in more than 95% with lymphoma. In patients with superior vena cava syndrome (SVCS) secondary to non–small-cell carcinoma of the lung, radiotherapy is the primary treatment. The likelihood of patients benefiting from such therapy is high, but the overall prognosis of these patients is poor. Chemotherapy may be preferable to radiation for patients with chemosensitive tumors.